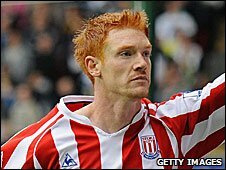 Stoke City boss Tony Pulis is full of praise for the way striker Dave Kitson has taken his chance back in the team. Having not featured since his two-month loan ended at Middlesbrough, Kitson has now played in Stoke's last two games. And he scored the opener in Wednesday night's 3-1 FA Cup fifth round replay win over Manchester City. "We had a good chat a couple of weeks ago after the transfer window. And Dave's come back from the wilderness really," Pulis told BBC Radio Stoke. "We agreed for him to get his head down, work hard and, if he gets his chance, take it. He's done smashing." After signing from Reading for £5.5m in the summer of 2008, Kitson struggled for goals in his first season with the club, failing to score in 18 appearances. But he had already broken his duck for Stoke this season, hitting three goals before he went out on his two-month loan to Boro, where he hit another three. And Wednesday night's strike took the 30-year-old former Reading man's overall campaign tally to seven. Stoke booked an FA Cup quarter-final date with Chelsea on 7 March thanks to Wednesday's extra-time win. But Pulis remains coy about the Potters' chances of lifting the FA Cup in May, preferring instead to concentrate on this Saturday's Premier League home match against Arsenal. "Let's get Saturday's game out of the way first," added the 52-year-old Stoke boss. "We're still unbeaten this year. "It would be lovely to get through that game still unbeaten, then we can go to Stamford Bridge and give it our best shot."